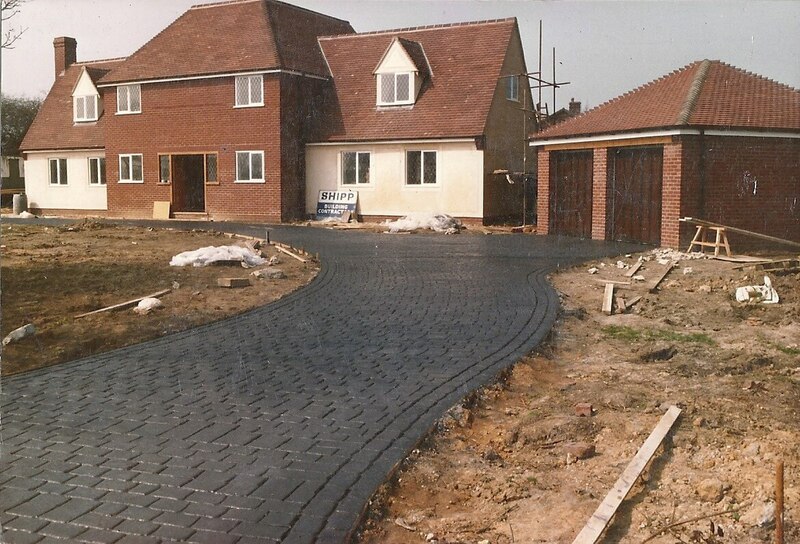 When the clients asked us to submit a quote for this patterned imprinted concrete drive, it was very straight forward, as everything was worked out so it was just a matter of counting the metres and submitting the price. Once again we won the battle to carry out the work, and by no means do we or ever have submitted quotations at a low price just to get the work. We are a well established family run company that offers top rated work at a fair price. We work under the principal of old school “you receive what you pay for” and nothing less. In these modern times we see this less and less from other companies as they are after the quick pound and the standard of work does not come into it. We think this is the reason workmanship has slipped and people do not take pride in their work anymore. This is one of the reasons we do not carry out site work on new build estates, as with a building if the foundations are not sound it is not stable, the same goes for landscaping, much of the work is below ground – sub level – out of sight, but is the cornerstone of the project. The first thing we did was to mark and excavate out the area for the new drive. We took the depth down to 8 inches “200mm” from finished level. The form work was set up to the required shape. This area was then compacted down followed by 4 inches “100mm” of type one material and compacted down again. 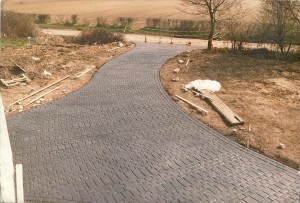 The drive was laid a section at a time using a 10mm summer cobble mix with fibre mesh. The concrete was poured and levelled with the finished surface left as a trowel finish. Coloured surface hardening topping was applied and trowelled into the surface. The area was covered in plastic and pegged down on the edges. The edges had a double cobble edging stamped into the concrete using the G tool. The rest of the area had a cobble pattern stamped into the surface using the cobble moulds. Expansion joints were cut into the drive every 13 feet “4 metres” using a bolster chisel and club hammer. Once the concrete had dried efficiently the plastic was stripped off with the surface finished off with a soft brush and trowel with any slight modifications rectified using cobble patterned hand tools. The rest of the area was completed using this process. Once the concrete was completely dry the form work was stripped back and removed. 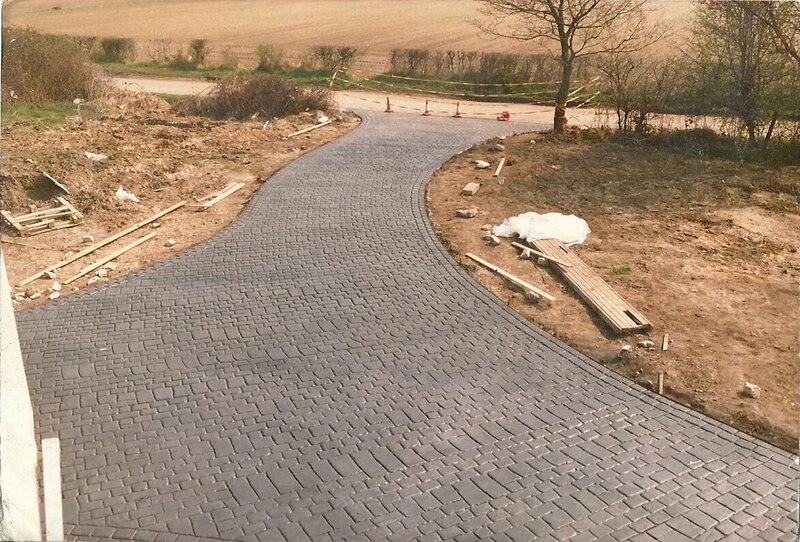 The new drive area was swept clean before 2 coats of patterned imprinted sealer were applied to the surface. 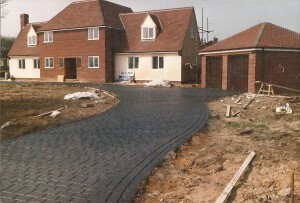 Applying the sealer does have several different benefits to the surface of the new patterned imprinted driveway. It brings out the richness of the colour used and stops the colour fading as it has an ultra violet barrier built into the sealer. It also helps stop any oil stains from vehicles penetrating the surface and is a lot easier to clean off to keep the patterned imprinted concrete drive looking in pristine condition for many years.